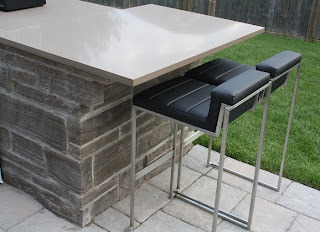 When planning your countertop for your island BBQ, check out this countertop that Dave suggested and installed. Quartz was selected instead of granite and other options due to it being more accommodating to the harsher Toronto weather condition. This installation used 1.5 inch thick quartz to allow for strength to to avoid the risk of cracking. The lighter colour of quartz was suggested to avoid too much heat and sunlight vs a darker shade.